I spent some time the last few weekends making various updates and changes to the lab. Too numerous and not all that paramount to go into detail here, with the exception of one issue I did run into. I created a new VMware Horizon pool consisting of Windows 10 Enterprise, Version 1703 (Creators Update). The VM has 4GB RAM and VMware Horizon Agent 7.1.0.5170901 is installed. This is all key information contributing to my new problem which is the Shared Folders feature seems to have stopped functioning. That is to say, when launching my virtual desktop from the Horizon Client, there are no shared folders or drives being passed through from where I launched the Horizon Client. Furthermore, the Share Folders menu item is completely missing from the blue Horizon Client pulldown menu. 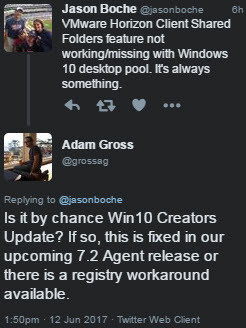 I threw something out on Twitter and received a quick response from a very helpful VMware Developer by the name of Adam Gross (@grossag). Adam went on to explain that the issue stems from a registry value defining an amount of memory which is less that the amount of RAM configured in the VM. The registry key is HKLM\SYSTEM\CurrentControlSet\Control\ and the value configured for SvcHostSplitThresholdInKB is 3670016 (380000 Hex). The 3670016 is expressed in KB which comes out to be 3.5GB. The default Windows 10 VM configuration is deployed with 4GB of RAM which is what I did this past weekend. Since 3.5GB is less than 4GB, the bug rears its head. Adam mentioned the upcoming 7.2 agent will configure this value at 32GB on Windows 10 virtual machines (that’s 33554432 or 2000000 in Hex) and perhaps even larger in the 7.2 version or some future release of the agent because the reality some day is that 32GB won’t be large enough. Adam went on to explain the maximum amount of RAM supported by Windows 10 x64 is 2TB which comes out to be 2147483648 expressed in KB or 80000000 in Hex. 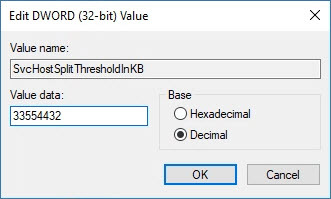 Therefore, it is guaranteed safe (at least to avoid this issue) to set the registry value to 80000001 (in Hex) or higher for any vRAM configuration. To move on, the value needs to be tweaked manually in the registry. I’ll set mine to 32GB as I’ll likely never have a VDI desktop deployed between now and when the 7.2 agent ships and is installed in my lab. And the result for posterity. I found a reboot of the Windows 10 VM was required before the registry change made the positive impact I was looking for. After all was said and done, my shared folders came back as did the menu item from the pulldown on the blue Horizon Client pulldown menu. Easy fix for a rather obscure issue. Once again my thanks to Adam Gross for providing the solution. You are currently browsing the archives for June, 2017.